Tutorial 2. Sewing On Rhinestones. Tutorial 5. Applying Rhinestones. Part 2. Detailed course on rhinestones decoration. This chapter is dedicated to working with rhinestones. Let's look at the materials I plan to work with. 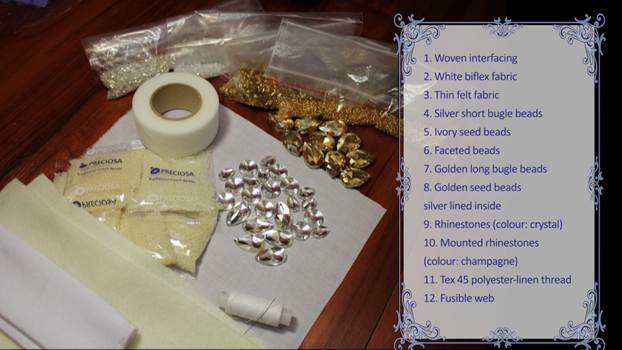 You can see a list of required materials in the picture below, as well as packs of ss16 and ss20 crystal-color rhinestones and large sew-on cut-glass rhinestones which will be the main highlight of the dress. I will sew the large rhinestones with 50LB nylon thread. I will also use some Е6000 adhesive. 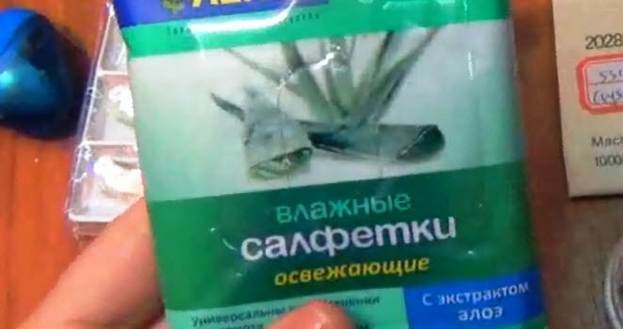 You need a syringe for applying the adhesive. Please note that it should be a 5ml syringe. Experience shows that smaller syringes are difficult to work with. And with larger syringes glue tends to leak out and you might spoil the garment. A pencil sharpener is another must-have. I use a special-purpose white rhinestone-picker pencil which needs to be sharpened every now and again. 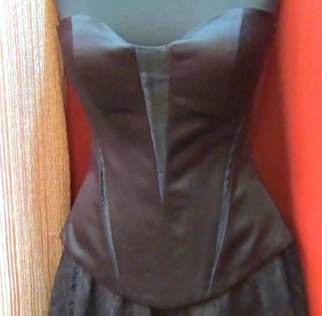 It is used for picking up rhinestones and putting them on the corset. I can say with full confidence that it's the most convenient tool for working with rhinestones of all sizes, including large ones. Along with that, I always use wet wipes (any kind). Wet wipes are good for cleaning the nose of the syringe and the nose of the glue bottle to prevent the cap from sticking to it. Clear round storage containers. I recommend this very kind. When you shake such a container up, rhinestones tend to turn decorative side up, which really spares you a lot of time.